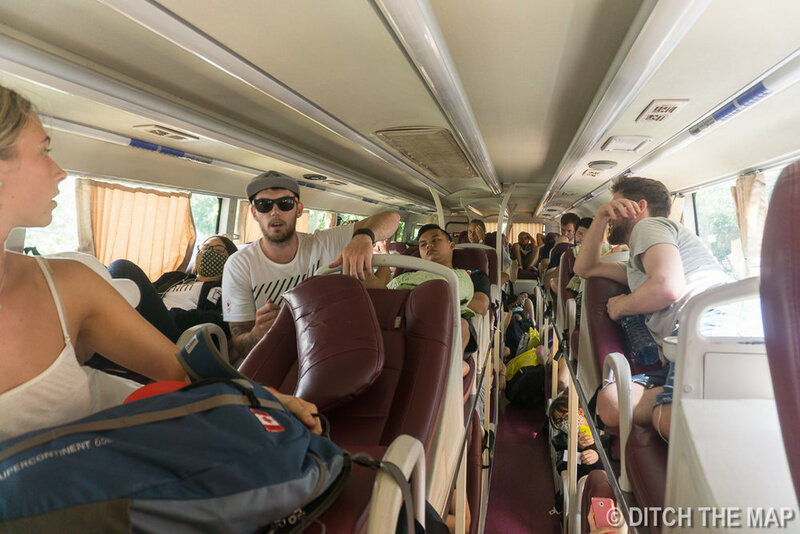 We took a 20 hour overnight bus direct to Hanoi. The bus was oversold and there were almost a dozen people sprawled out across the floor for the evening's bus ride. I'm glad we had gotten our own seat. The seats were actually individual-reclining beds and quite comfortable. I can only imagine how tight of a squeeze it would have been for anyone larger than me though. During our 30 minute walk from the bus stop to our hotel we walked across a park where hundreds of people were doing their early morning workout routine. It's a very funny sight to see a group of relatively non-athletic vietnamese people doing awkward exercises. It seems as though they do these routines more out of habit and superstition than for actual good health--I get more of a workout walking around a city then these people. However, some where really getting into it--god for them! The Vietnamese are known for being early risers. Works starts sharply at 7 for many, but the streets are already crowded at 5am. Men and women playing badminton, street-side stalls selling fresh food, and motorbikes starting to clog the streets. We checked into our lovely hotel (which was only $23/nt thanks to last minute booking) The room was normally over $50/nt, but here in Vietnam you never really know what's true and what's BS. Sold by vendors on bicycles along the crowded streets in Hanoi, Bánh đa Kê is a simple & cheap dessert on a summer day. Millet is cooked into thick paste, then placed atop a piece of crunchy crackers. The seller spreads this thick layer of millet and adds another layer of ground mung bean, and tops everything off with a thin layer of sugar. Cháo sườn quẩy (ribs rice porridge with fried bread stick) is cháo with grilled pork rib meat (without the bone). Cháo (rice porridge) is one of the two most popular foods in Vietnam, along with cơm (boiled rice). When it’s called cháo only, it means other foods aren’t added. It is basically made from rice and water. In order to make rice porridge, the amount of water must be three times more than the rice. The mix is initially boiled at high heat, then slowly cooled. Green onion is usually added to the porridge, along with other minor ingredients. Sometimes, quẩy (fried bread stick) is served upon request. “Cháo hoa” (“flower rice soup”) which is made from unmilled rice. I ate dog meat for the second time here in Vietnam, my first time being in Can Tho. We went to the city's most popular dog meat restaurant, Quan Thit Cho, which was simply a open air kiosk on the curb that sold pre-cooked dog meat by the kilo. I bought half a kilo and got some chunks of sliced meat and a few sausage links which were made using organ meat and dog blood. The meat wasn't quite as good at my prior experience down in the Mekong Delta. I made sure to order beer with my meal, which is customary when eating dog meat. 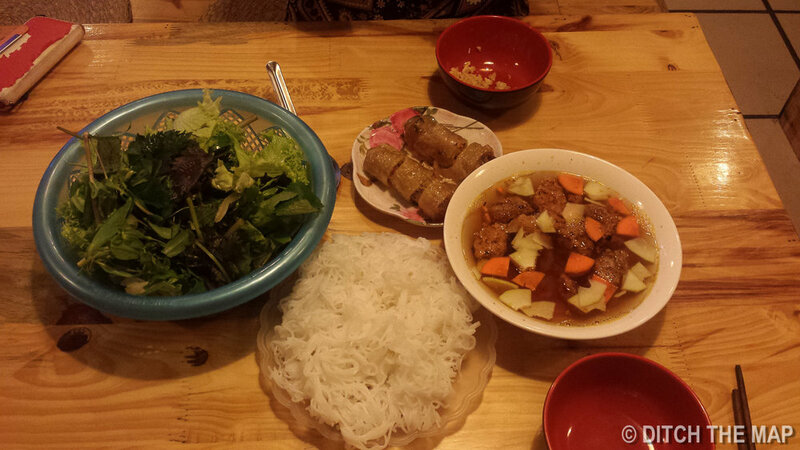 We ate with two people we had met on our walk to Quan Thit Cho. A girl from Chile and a guy from Malaysia. I showed them how to properly eat the dog and insisted that they too order beer for the genuine experience. This is Japanese rice cake made of mochigome, a short-grain japonica glutinous rice. The rice is pounded into paste and molded into the desired shape. In Japan it is traditionally made in a ceremony called mochitsuki. While also eaten year-round, mochi is a traditional food for the Japanese New Year and is commonly sold and eaten during that time. 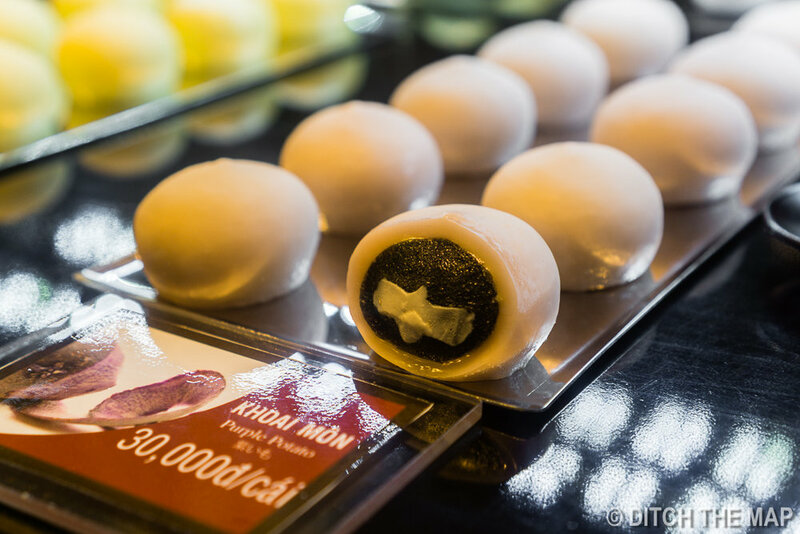 A high-end dessert shop, Mochi Sweets, sells fancy mochi treats and we enjoyed it very much. These Vietnamese hollow donuts are amazing. They have an almost caramel-like taste and are to die for. I was pleasantly surprised by how much Hanoi has transformed itself since my last visit, 8 years ago. The omnipresent spitting has become a thing of the past. Almost all of the younger generation now has tablets or smart phones. English is no longer some exotic language. only heart on blockbuster films. I felt so much safer walking around the city. It may be that I'm older and more traveled, but I think that there just isn't the level of desperation that once hung in the air such a short time ago. Although the city seems much more prosperous now the transformation brings with it some downfalls. There just isn't the amount of street food that once flooded the streets and side alleys. There are more western-style cafes and restaurants. This seems to be the case in much of SE Asia though (Siem Reap, ugh!). Thankfully one morning we walked around early enough to catch some street vendors selling some authentic foods. What a delight. Other than walking around the Old Quarter and visiting a few markets we didn't do to much. We will return to Hanoi for another night or two before our departure to Myanmar. Hopefully I'll go to Le Mat, which is a snake village only 7kms ago. I will get to buy an entire snake, which they kill at the table, and then continue to serve 7 or so plates using all of the 'parts'. I hear the snake blood and snake bile drinks are quite interesting. You can even eat the still-beating heart if you desire...I will have to try it (though I'm not excited about it). I returned to the puppet show excited to show Sylvie a traditional water puppet theater. It was interesting, just a bit long and monotonous. It's interesting to see how one culture can find some music so beautiful while another may perceive it as loud and obtrusive sounds.